This much requested and eagerly awaited feature allows users to assign multiple people to a single task. Many organisations have jobs that don’t need to be assigned to a specific individual but just need to get done. 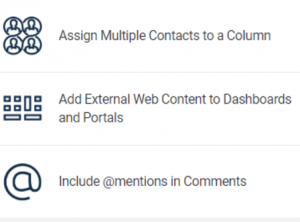 We are very excited about this new feature, which takes your dashboards to the next level. With the web content widget you can embed, view and interact with content from some of the most popular online applications like Google, Microsoft, Tableau, YouTube and Vimeo, directly in Smartsheet. Smartsheet content and external content can be surfaced in a central location, empowering your team with the information you need to move work forward.